Global Delight already has its eyes on the forthcoming iPhone 4.0 release. The app maker has vowed to add support for the new iPhone OS to its Camera Plus Pro all-in-one photo and video app once Apple officially releases the update. But that doesn’t mean Camera Plus Pro is in a holding pattern until then. An update to the photo app—version 2.3—has hit the App Store, introducing enhanced video capture and sharing features. Camera Plus Pro is a multipurpose camera app, combining a number of image-editing features with improvements to the iPhone’s built-in camera. The 2.0 version of the $2 app, released earlier this spring, gave original iPhone and iPhone 3G models the ability to capture video. Video remains front-and-center in the new 2.3 udpate to the app. Users can now pause when they record video, and there are six more video filters—Mirror, Horizontal, Flip, Warm Vintage, X-Ray, Vivid, Vintage—that users can apply to their video clips. 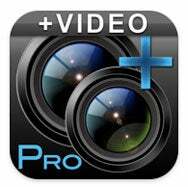 In addition, Camera Plus Pro now features a time-lapse video recording capability. The update also expands Camera Plus Pro’s sharing capabilities. You can now share images via FTP and the app’s existing support for uploading photos to Flickr has been augmented to add private and public modes. As for the future, support for the iPhone 4.0 OS isn’t the only trick up Global Delight’s sleeve. The developer also promises to add exposure and white balance control, Bing image search integration, improved video recording capabilities, and a revamped user interface in future editions of its camera app.